If you’re a small to medium sized business owner, chances are you have a lot on your mind and many tasks to complete. You might be concerned about your cash flow, if your employees are going to get paid, those repairs that your business or website needs, and so many more. So why worry about your marketing? Why worry about finding the time to do it, when you know that the best marketing takes a lot of time? You know you need to do SEO and email marketing and social media and content marketing and…phew, I’m tired just typing that. So how do you automate as much of your marketing as possible so that you have time to do other things? If you’re not a professional marketer, why take your needed skills away from your business to become a professional marketer? The easiest way to automate your marketing is to outsource it to a professional. You’ll still be involved of course, as you will be responsible for (some) execution on the plan, getting the consultant up to speed on your industry, and more. But often, a good consultant can go a long ways to get you to your goals. Required reading before you do this though: Why Your Business Isn’t Ready For A Consultant, How To Structure A Consulting Agreement. Ready? Click here to find one. Your business has social media profiles right? (If not, one of our social media consultants can help you out.) But updating them with useful information consistently is hard, no? The first challenge is finding the right content to share, the second is setting it up so that the management is super easy. We’ll tackle the issue of finding the right content to share in another post, but the second part can easily be solved via Buffer. For HireGun, I often do this from my phone as Buffer has an iPhone app. I see content I want to share (often seen on HackerNews or Twitter) and can easily add it to the HireGun queue from my phone. In as little as 30 minutes a week, I have great relevant content queued up to be shared at preset times when I know the audience will be online. Win! Everyone wants great press about their company, and that often starts with the founder being seen as an expert in their field. But getting press can be really hard. This is why I recommend signing up for different aggregators where journalists put out calls for sources to interview. This way, you do not have to go create content, vet the journalists you are pitching, and go through the whole process of pitching and waiting for something to go live. Instead, you get to use your already-built expertise to respond to journalists who you know are expressly seeking your knowledge. HARO (Help A Reporter Out) is the most well-known, and it’s free. When you sign up, you tell HARO which topics you would like to receive pitches about. They send you a daily email with all of the pitches and you can respond directly to the journalists who are asking for sources/quotes. ProfNet, via PrLeads, is a paid tool which means that it’s not free like HARO, but consequently the leads and publications are going to be higher quality. I’d recommend testing it for a short period of time to see if the expense has positive ROI for your company. Mention on your blog that you are accepting guest authors and give them a place to pitch you ideas. Find well-known writers/bloggers in your space with a good social media following or email list and invite them to be a guest author. Having guest authors isn’t completely automated of course, as you should still maintain editorial control over the ideas and the content that is written to be published. However, this strategy removes a large chunk of the time-consuming work. Have a service that needs emails sent automatically to new prospects or when someone does something on your site? Mailchimp (among others) is known for making email newsletters simple, painless, and pretty. They have integrations with many different platforms, so it’s easy to build your email list. But many people do not know that they also have an Email Automation service, which costs as little as $10 per month and scales up from there depending on how many emails you send. We’ve used Mailchimp here at Credo for years, though moved to Drip early in 2018. We highly recommend using the ESP of your choice to automate your email marketing as much as possible. 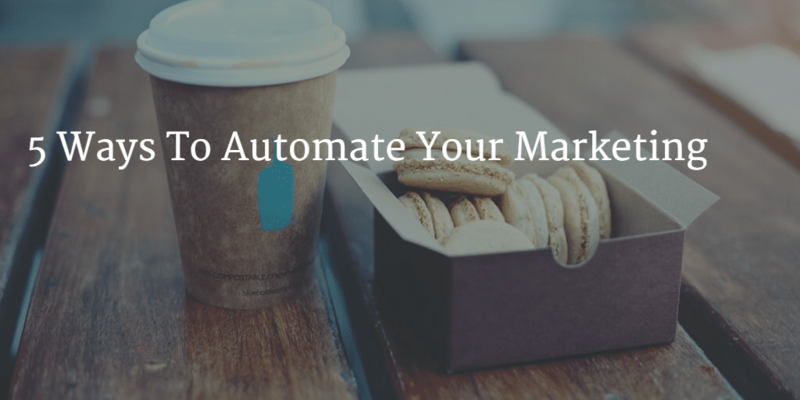 What other ways have you found to automate your marketing? We’d love to hear your tricks and strategies!